Montagu is a small country town that is surrounded by fascinating mountains whose rock striations show that some terrible tectonic plate shifting happened here very long ago. Two rivers, Keisie and Kingna, that flow from the hills behind Montagu converge in the valley and then negotiate the rocky terrain toward Ashton. The road that runs through Montagu – route 62 - used to be one of the roads connecting the two harbours of Port Elizabeth and Cape Town. The old toll-house in the valley next to river between Ashton and Montagu still stands today, although it now offers accommodation. Route 62 passes through Montagu, and continues to Oudtshoorn through the Klein Karoo. 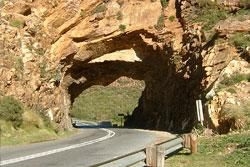 At the entrance to Montagu, the road passes through a hole in the rock face. Interestingly enough there was a British fort above this Hole in the Wall way back in time. The fort’s remains can still be seen today. The town was established in 1853 and most of the Cape Dutch thatched houses were built between 1853 and 1870. The hot springs' healing powers are said to have been discovered by some Voortrekkers; after one of their party’s hand was hurt they noticed near miraculous recovery after he bathed his hand in the water. They followed the river to it’s source and discovered the springs. 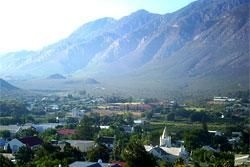 The life in Montagu is peaceful, slow and relaxing. 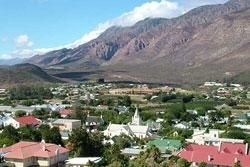 Days in Montagu literally seem to have been slowed down. The local people are friendly and the hospitality is legendary. Add great cuisine at a number Montagu restaurants, and its location along the popular Route 62 Wine Route, and this country town delivers a stay that will refresh the soul.